Classic Elite Yarns: Knitcircus Gifts Giveaway! Yup, I'll say it. Christmas is 69 days away. After Halloween, it's a slippery slope to the holiday season. Can you stand it? 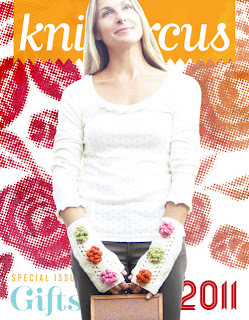 Knitcircus recently released its Holiday Gifts edition, and what an issue it is! Packed with small, simple knits, you're sure to find a pattern that's perfect for that special someone (or let's face it, for yourself. Am I right?) I was thrilled to see this piece by Jane Prater. Scroll to the bottom for a special giveaway! Triangle shawls are so wonderfully easy to knit, but they fall off my shoulders. 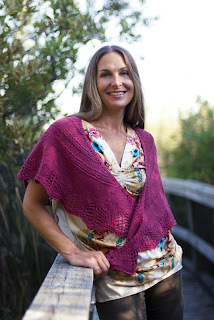 I wanted a shawl shaped like my body to stay on through the day, and a design easy enough to knit in public. The shaping is the star of this piece, yet the increases are super simple. Wear it pinned, tied, or just hanging loose. Any way you wear it, it will stay on your shoulders and keep you looking good! The yarn is Magnolia, a yarn I could go on and on about (and I have...) It's soft, luminescent, the perfect gauge, and comes in a stunning range of soft, sophisticated colors. Jaala Spiro, the editor of Knitcircus, is offering a very special giveaway! Three people will receive the ENTIRE COLLECTION of patterns from Knitcircus Gifts 2011! That's 13 patterns! Not only can you make the Shapely Shawl, but you can make any number of the other 12 patterns. Because they're all yours! All you have to do is comment here, and tell us what you think about holiday knitting. Do you knit to show your love to all your friends and family? Or is it just for the extra-appreciative? Or, my personal opinion, who has time for gift knitting when there's so much to knit for myself? The contest will close at noon on November 1st, when the winner will be chosen at random. Please be sure to include some way of contacting you, whether it's by email (spell out the "dot" and "at" for extra security) or Ravelry. Comment away! with all the projects I have on needles right now, if anyone gets a holiday gift, they'll have to consider themselves very lucky! Holiday knitting is a good portion of what I work on all year long. I have a large family and knitting is a calming thing for me so my family receives many items from me through the year but a good portion at the holidays. oh....I always have the vision that I will knit for everyone and in fact...it's just not possible...but I have lots in process so someone(s) will get a knitted gift...thinking stocking caps for the 4 younger children. I knit for close family, people who know the time and effort put into it, and I also knit warm garments for a baby orphanage in the country my son is from. I sometimes like to sneak in something nice for me, since I'm worth it!! I like to knit gift whenever I feel inspired to make a special treat for somebody. It can be a sweater for my son or a shawl for a colleague at work or socks for my dad. I don't do special holiday knitting as fall is usually a very busy period and I wouldn't get anything done by Christmas. I have a love/hate relationship with holiday knitting. I *want* to knit for everyone - family, friends, people I barely know - but the reality is that I just don't have the time or energy. So I knit what I want to knit and if a gift pops off my needles, great. If not, I have still enjoyed myself. I love holiday knitting! There is nothing more special than a one of-a-kind hand made gift, for the recipient and for the giver. I've always felt that my knitting is a direct connection to the generations of women in my family who taught me to knit. So when I knit for my children, nieces, nephews and friends, I am making a gift from my own hands and, in a way, from the hands of my grandmothers, aunts, and my mother, who nurtured in me an appreciation of beautiful handiwork. sherryatdelightfulhandsdotcom - I do knit for holday gifts for family and friends. People feel special when I put that time and effort into their gift. You do seem to have to start earlier and earlier though. Wow, really, free patterns, what knitter wouldn't want this. Very cool. I do love knitting presents for people, but it's really hard to find the time. Only the most special and appreciative people get handknits!! I'm doviejay on Ravelry! I enjoy knitting for my husband and daughter....seems like other people aren't as appreciative of hand knit items. I love looking over new patterns - i am not much of a holiday knitter still trying to comfortable with how my projects turn out. My goal for Christmas is to knit one thing for every immediate family member. I have a feeling that I should have started sooner, but I still have 69 days left I guess. This Holiday Edition of Knitcircus would certainly help me out!! I enjoy holiday knitting and gifting. Unfortunately there are few individuals in my life that don't seem to appreciate the effort and cost that goes into knitting gifts and would prefer that I buy my gifts instead. (No complaints about the quality of my knitting, I get the impression that they think I handmade something to save money.) Little do they know how much yarn costs these days. This year, I'd like to knit something for myself. I love knitting for others but I'm slow so only commit to one or two knitted gifts. I have socks for the hub to finish, gloves for me and a blanket for me, but a grandbaby coming in the spring! I knit for anyone who will appreciate it! But after one failed Christmas gift, I ONLY knit for those who will appreciate it. I wish I didn't have to sleep, there would be so much more time to knit! I started my holiday knitting in September. I'm not knitting big projects, just hats and scarves. I'm enjoying knitting for others for a change! This is the first year I will have time to knit gifts for my family. I have also made my first shawlette and absolutely loved it! I am now searching for other shawls, wraps and scarfs with some lace to make as gifts. I will be doing limited gift knitting, but will fit in hats for the children. Hubby can't think of anything knitted that he would like! I will, however, be gifting myself some yarn for future lace projects! I try to make lots of knitted and handmade gifts...quick things like hats are a great option :-). I need to plan carefully for anything bigger than that. Of course, knitting for myself gets pushed aside! Everything I knit goes into a basket as a potential gift. I confess that sometimes the gift is for me, but I gave a fair number to choose form when the holidays come round. Throughout the course of a year I usually take a lot of classes or at least teach myself new techniques. For example I learned how to do drop stitches with a scarf that I gave to my mother for Christmas two years ago. Those items that come out and I just know will be put to better use, and more appreciated by someone else almost always become Christmas gifts to family and friends. Aside from that knitting has embedded itself into our Christmas family traditions as of a few years ago when I was first learning how to knit. I began making washcloths to teach myself various stitches, learn how to knit and purl, and also how to cable this year, and I save them up every year after blocking them and storing them away, and give them to my parents for Christmas. They use them constantly, and it's become my own little holiday knitting tradition with them. I don't foresee a Christmas holiday that won't in some way incorporate my love for knitting, and shawls, of course, are my new favorites to make!!! Shapely shawl is lovely. I will probably make something for my DGD and DD. I always intend to make lots and lots of knitted holiday gifts... but I don't really think it's worth all the stress that it produces. I think that this year I'm going to pare down the amount of knitting I do. Quality instead of quantity. I adore this year's collection! I've always had a HUGE Christmas knitting list, but I have so many clients to knit for right now, I'm afraid friends & family knitting will be an after-holidays event. I don't have enough time or patience to knit for everyone, so most get a knitted gift every third year. It means they get something a little nicer, and I'm not up all night Christmas eve! I just taught myself how to knit a few months ago and I am now addicted. Everyone on my gift list will get a knitted gift this year. I'm half way through my gifts and i'm super excited to give them to people this year. I should have enough time to even knit some gloves and scarves for a local homeless shelter! I love to knit Chistmas gifts, I usually choose a theme - this year it's fair isle mittens! The only way for me to finish all my knitting in time for Christmas is to take my projects with me! I am knitting for immediate friends and family, mostly socks or mittens. Glad to see that the new Knitcircus Magazine looks like it has lots of helpful ideas for the upcoming holiday season :) You can reach me on raverly with mleasum. I like to knit gifts,but only for those that will appreciate them. Most of my immediate family does, because they see the time I put into knitting! I also really try to make things that will suit them, not just generic gifts. I also knit for family all year round, so they know that they'll get something at any time! I occasionally knit for the holidays - I knit too slowly to make something for everyone, and so I only rarely knit for anyone for Christmas. Knitting for the grandchildren and children for the holiday's is on joy and happiness. To have them so proud of their gifts. I just promised myself that I wouldn't subject my family to knitted gifts again this year--- only because I've been knitting for myself all year. Maybe next year they'll have to pretend that they like their lop-sided hats and weirdly hued scarves! LOL! I don't do a lot of holiday knitting because I really only want to knit for those who I know really appreciate the time and effort that goes into a finished object. On Ravelry as jaydawnrn or jdthomas1974 at msn dot com! This will only be my second Christmas as a knitter, so I haven't really done any Christmas gifts yet. I would like to for a few special people, but there is so much that I want to knit, that I can't possibly get to all of it! katgat on Ravelry. I don't knit for most people during the holidays. There always seems to be too much going on. But this year there are a few babies on the way, and they must have something wooly when they get here. Christmas Knitting? What's that? At Christmas, I really don't knit for anyone except for daughter and hubby. But this year I'd like to knit a pair of plain gloves for a couple of close friends. "Cottonblossom" on Ravelry. I loved the knit gifts issue - I have a pretty limited attention span with my knitting and I much prefer making small items (socks, gloves, scarves, hats, etc). Lots of great ideas in this issue! I have so many projects going, I love knitting presents. I am sure I will need some last minute pattern for someone I may have forgotten, perhaps even me. Mamsy on Ravelry. 69 days until Christmas? Omyword. I have NeVeR seen KnitCircus before this! 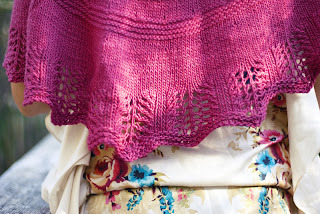 Magnolia looks beautiful and I love wool and silk blends with sheen. I knit for my granddaughter first, anyone else second and myself last. However, this will be the 3rd year my daughter-who-knits will knit up a gift for me of my choice. I would choose something from this giveaway if I am the lucky winner. I like knitting mittens for holiday gifts. They're quick, easy to personalize (like flip tops & flip thumbs) and you get a lot of bang for your buck since they don't take a ton of yarn. I also enjoy knitting up scarves & shawls for gifts when I have enough notice. Only a few select people would get knitted gifts from me: mostly those I think would really appreciate it & maybe, maybe my husband ;). i love the idea of holiday knitting and tried it last year but i found that not everyone appreciated my efforts as much as i would have liked them to! so, now my efforts are reserved for those that really deserve my hard work. ME! I've been making something for my sister every year because she's the only one who appreciates it. And I love KnitCircus! I love knitting and just tend to give people stuff when I feel like it. I've stopped pressuring myself to complete projects for Christmas and just knit as usual. I have a large stash of wash cloths as back-ups that I make in sets all year inbetween large projects and give those when I need a gift to give. I'm Brownowl on Ravelry. I love to knit for Christmas gifts. I've made bags, blankets, fingerless gloves, hats and socks. I probably won't go as far as making sweaters for everyone as that takes a lot of time. I would really love some new patterns and ideas. Hint Hint! I only give hand crafted gifts - small knits for the really special people in my life and goodies baked with love using only the finest yarns and ingredients. I love holiday knitting. But always do more than I have time. Need to get back to setting aside one day a week for gift knitting. I always try to make or knit gifts for everyone, but often start to late and their gifts end up more as a new years present than a Christmas gift...but it doesn't stop me from trying to get everything done in time! I swore no gift knitting this year, but I already have a small pile of knitty things that kind of look like they might be gifts. I still haven't decided though! Lovely giveaway idea, thank you. I only make small gift items like mittens or hats at Christmas time. These always seem to fit and are appreciated in the cold weather. I usually have some easy projects for myself going...and I save the larger or intricate projects for after Christmas busy time is over. My family waits all year to see what I'll knit them for the Holidays, and I can't wait to knit for them. It's so personal and I can match the perfect present with the perfect yarn and color for each member of the family. I do Holiday knitting all year long. I'm Claudia321 on Ravelry. I knit whatever my mom want me to make for her, and knit a dress once a year for my little daughter's birthday. I don't knit many for my son and hubby .. boys are picky. For holiday I knit little things for close friends, teachers, and school bus driver .. just wish I could knit bigger things for them to show how I love them and appreciate what they have done to me and my family. I am definitely not the only one who would love those patterns! My holiday knitting is to knit for immediate family and then make several versions of one small thing (like an ornament or hat) and hand those out to my close friends. It interesting to read all the comments. My kids get knitted gifts throughout the year. The problem with holiday knitting is we do not exchange names until Thanksgiving and there are over 30 possibilities. I have made a cowl and a scarf. There is not a lot of time between the 2 holidays. I am thinking about rigging;) the picking this year- my niece wants "my" sweater and she has been a good girl. love2read - Rav id. I just love to knit and I have so many people to knit for...I would just love to win this package and play and knit wonderful projects for my family, friends and of course, me if there is anything left...who know's maybe I will start with myself first. How fun would that be....smile...Happy Holidays to everyone. Sometimes I question why I bother giving hand knit gifts to friends because I really don't think they appreciate it. Then, last year, I knit a hat for my older brother as a last minute addition to his gifts and I swear he didn't take it off for two days straight. As soon as it was opened he put it on his head and didn't take it off for the rest of the night. The next day he showed up to the party at our uncle's house with the hat still on his head and did not take it off the entire day. His girlfriend even said he wore it to the holiday party with her family that morning. So I guess when it comes to recipients being appreciative, actions speak louder than words. He'll be getting another hat from me this year. I'm wonderfulone on Ravelry or at gmail dot com. I am well known not to knit for others except my daughter(occasionally), so to receive a gift of knitting is a speial event. I do ,however, plan to knit for a few special someones this year and I beleive they will love what I have planned for them. I have so many CEY projects waiting that I want to hurry up and get the holiday knitting done so I can get back to projects for me! I am currently working on the fresco shawl from the fall Vogue. I am knittinggirl 47 on Ravelry. Thanks and Happy Knitting to all. I always gift knit & sometimes I regret it when I've made something awesome & give it to someone only to never ever see it again! I make some handmade gifts for friends and family that I know will appreciate it. Some I know won't. But that's ok because hubby has a large family and it would take me all year (maybe more) if I were to knit for all of them! I'm just starting my holiday knitting and it's getting crazy. I have ideas for most people but 13 more patterns from Knitcircus would definitely boost the idea pool. There will be a white Christmas in southern California because I am knitting up a storm!!! I will knit gifts if something strikes me as right for someone, otherwise, it's all mine. I knit gifts for friends and family because I enjoy knitting and if they like what I give them and actually use their gifts it is a bonus. After all I can only wear so many pairs of socks or use so many pretty shawls & scarves. Happy Holidays All. Wow. So soon. I start knitting for holiday gifts (many many birthdays in Oct, Nov and Dec PLUS the Solstice, Jewish and Christian winter holidays) in March each year. I make a list and sometimes make the same pattern (like socks or a man's scarf) a few times for different men in the family and then something for each person. Every year. Did I mention that I had a small family until this year when my son married into a very large one. We will see if I can continue my knitting gifting with a baby coming along as well !!!! Anyway, it is a delight. Folks really like what they get (and they are not being polite). We live in Buffalo NY so most folks go through knitwear pretty quickly and get bored with what they have .... so it is a challenge and loads of FUN and a great way to express love. I am knitting holiday gifts all year long. Today I discovered that I don't have a hat or scarf ... so cast on I shall. MOREEN at Ravelry. Holiday knitting is reserved for my sister and my grandchildren. They appreciate and wear the items I handknit for them. A couple of the grandkids have already put in their requests. I give knitted gifts to myself (LOL) and to those I love most - grandchildren! And I usually reserve time to knit a special gift or two as a suprise for a friend or two at work. I knit mostly for my granddaughter - altho I'm knitting a shrug for my daughter in law right now! I knit because it creates something that is unique. No one else will have exactly the same thing... and the effort put into the gift is almost always appreciated. I usually knit Christmas presents. This year I will be making mittens for my SIL, BIL and nephews who just moved to Chicago in Illini colors. They're going to need them! I started knitting Christmas gifts in the Spring to make sure I'd finish and am half way there! So far I'd like to keep the scarf, hats and slippers for myself so they turned out to be very nice gifts! Knitting for Christmas gifts is soooo difficult - what to make, will they appreciate the effort, do I have enough time!? Yikes!! Only small knitted gift for Christmas, but mostly I knit for myself, best friends and family. Holiday knitting is great as it gives you a chance to knit something special in a yummy yarn - and then give it away!! Holiday knitting for me usually starts in January. Lest you think I'm Planny McOrganized, I invariably give my knitting away randomly throughout the year which leads to a holiday knitting frenzy. It seems to me that most knitters are generous people; I knit more gifts than personal items. 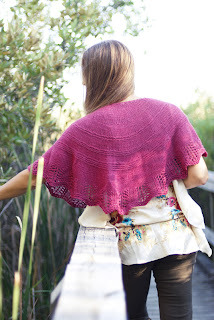 By the way, I absolutely love the shaped shawl and I love *love* Magnolia.This knitted shawl would be mine, all mine. Going to Knitting Lab? Want to Win? Fire! Somebody Grab the Yarn!